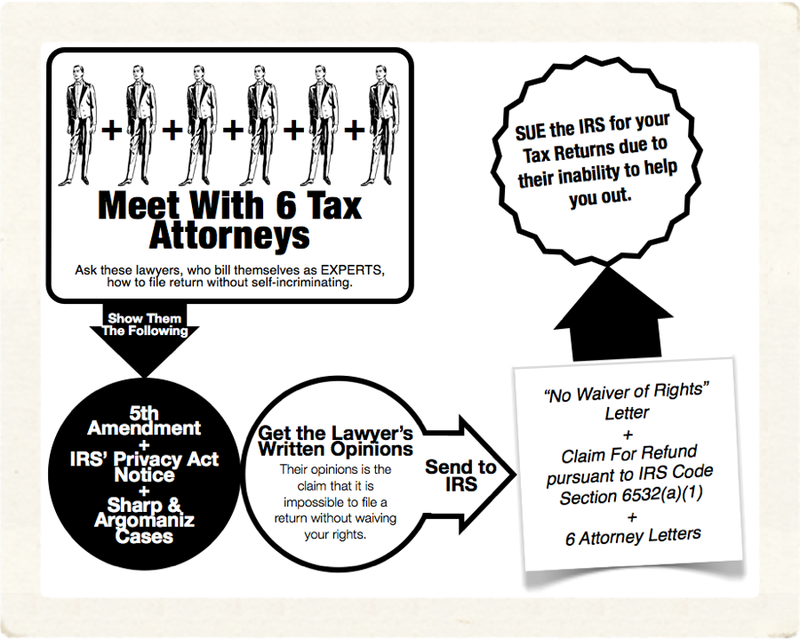 Meet with a few tax attorneys who bill themselves as tax experts and ask them to explain to you how you may file a tax return without waiving the constitutional protections of your rights. Show them the Fifth Amendment, the IRS' Privacy Act Notice, and the Sharp & Argomaniz cases to show that the 5th Amend is not only for when you are under criminal investigation or prosecution. After each consultation that they have admitted to this ask them to put their opinions in writing on their letterheads. If you are an employee pay your yearly taxes and me sure you do not owe anything at the end of the year. The IRS owing you is ideal. At year end, instead of filing a return, send a letter in to the IRS explaining that you have become aware that filing a return requires you to waive your rights, which you no longer wish to do. Explain further that you have consulted with several professionals and none have been able to tell you how you can file a 1040 return without waiving your rights. Include photocopies of the attorney letters. State that you wish your letter to also serve as an informal Claim for Refund. Now, pursuant to IRS Code Section 6532(a)(1), unless the agency can inform of a way you may file a return within the next six months (without waiving your rights, of course), you are entitled to sue the IRS to enforce your claim. Section 6532. Periods of limitation on suit. (a) Suits by taxpayers for refund. (1) General rule. No suit or proceeding under section 7422(a) for the recovery of any internal revenue tax, penalty, or other sum, shall begun before the expiration of 6 months from the date of filing the claim required under such section unless the Secretary rends a decision thereon within that time, nor after the expiration of 2 years from the date of mailing of certified mail or registered mail by the Secretary to the taxpayer of a notice of the disallowance of the part of the claim to which the suit proceedings relate. When you sue you are in the drivers seat and they are trying to explain why it has not been able to respond to your concerns for rights. At that point the suit is to collect from the letter 'Claim of Refund'. Although a law suit sounds scary, the paperwork is actually easier than the 1040 form. And once you have done it one year all the paperwork is the same except for changing the year and updating any details to new tax code revisions. It is believed if 100-200k people were to do this. IRS would collapse within two years and Congress would be forced to rebuild a better system. Check out www.azfairtax.org and www.fairtax.org. We will be offering all the paperwork and instructions for the entire process so all you do is fill out the paperwork and follow the directions.